Cocoon is known for their organizer GRID-IT panels that can be found in their bags or are available separately to organize your own bag. They have created the SLIM Backpack MCP3401, with pockets to protect your MacBook (up to a 15″ Pro) and iPad and still have room for papers in the back compartment. The front compartment features a 16″ X 10.5″ GRID-IT panel to organize your chargers, pens, cables, and other small gadgets and gizmos; and external zipper pocket holds even more stuff. The exterior is water-resistant ballistic nylon with waterproof zippers to keep your things dry. The bag dimensions are 12.25” wide X 16.75″ tall X 2.75″ deep empty or 3.5″ deep fully loaded and weighs 2.5 pounds empty. It’s available exclusively at the Cocoon website or at Apple Stores for $79.99. 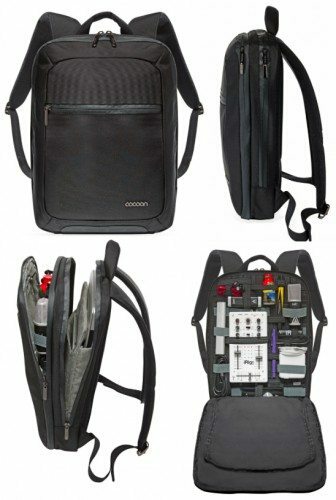 Cocoon introduces “the world’s most intelligent backpack” originally appeared on The Gadgeteer on July 23, 2013 at 1:00 pm.